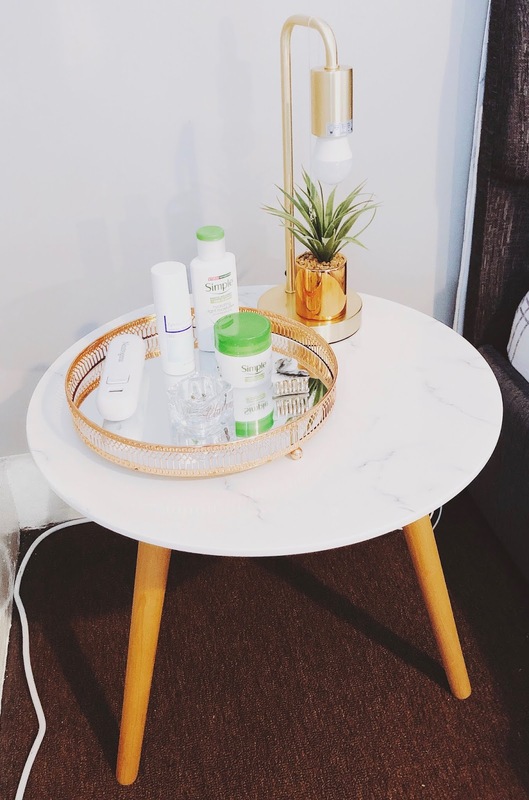 If like me your a bit nosy and like to see what kind of stuff that is kept on our bedside tables, then this blog post is definitely one for you to read because I am going to be showing you exactly what is kept on my bedside table and including a picture of my gorgeous bedside tables aswell. The bedside tables that I have are ones that I found in B&M, they have a white marble top with three light wooden legs that slant out to the side. I'm pretty sure these tables were just £19.99 each which I personally think is a complete bargain compared to other ones that look exactly the same but cost hundreds of pounds! First up is my Epiduo cream which was prescribed to me by my doctor for my skin, as I suffered really bad with acne for years before deciding to get something from the doctors to help with it. I only use this maybe 2-3 times a week though as it really dries out your skin and makes it feel really tight. Next I have both my day moisturiser aswell as my night moisturiser, both are by the brand Simple and again these were also recommended to my by my doctor. I never used to be one for night creams but i find I need to now as I find my skin gets really dry throughout the night, and this Simple night cream helps to keep my skin thoroughly moisturised throughout the night. I then have my Neutrogena Cartridge Applicator that attaches to my Light Therapy Acne Mask that I use twice a week on the days that I don't use my Epiduo cream. This cartridge only has 30 treatments sessions before you need to purchase a new one, I only buy about 3 a year as I don't use it all the time when my skin is behaving itself. Lastly I have a personalised tealight holder that I received off a lovely friend for Christmas, I know it's meant for a candle but I decided to just keep my earrings, rings and the tiny charging adapter for my Apple Pencil in there so I know where they are at all times. I also have a random hair clip just incase i need to clip my hair up for any reason in the morning.